What can the films Carrie and Halloween teach us about our own fears? Marilyn Ferguson, a founding member of the Association of Humanistic Psychology, observed that “Fear is a question: What are you afraid of, and why? … Your fears are a treasure-house of self-knowledge if you explore them” (Moncur). Horror movies are one of the unique tools that human beings implement to explore their deepest fears. Audiences are invited back to the forgotten or discounted moments of their childhood when certain people and places frightened them to their core. 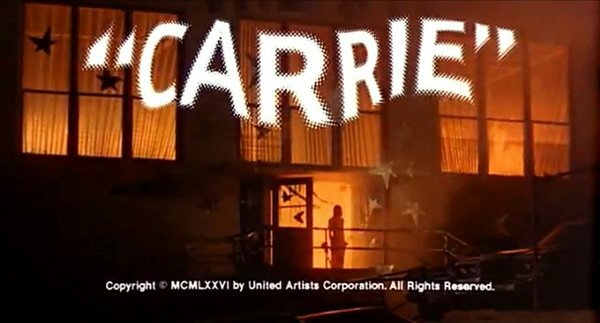 The iconic horror films Carrie (released in 1976) and Halloween (released in 1978) challenge us to confront a variety of these infantile fears – most notably the physical and mental dimensions of the closet. Through the use of contrasting aspects of narrative and formal elements, Carrie and Halloween expose the duality of human nature that allows us to be attracted to and terrified by the exact same space. Being members of the same specialized genre, Carrie and Halloween share many similar film elements used almost exclusively to establish certain moods within the same space. The scene from Carrie in which Carrie’s mother locks her in the closet to pray and the scene from Halloween when Laurie is scrambling into a bedroom closet in an attempt to hide from Mike Meyers, hold some of the most striking parallels. Beyond the narrative likeness of the two scenes, both make use of the mise-en-scene tool of low-key and high-key lighting. When the camera inhabits Laurie’s point of view in the closet, we see a dark, almost bottomless looking space, with light coming in through the slats of the closet doors. All of the clothes and hangers are deep in shadow. Yet when the camera cuts to focus on Laurie herself, she is brightly lit, left with no shadows to hide in, exposed in her corner of the closet. In the same way, the closet Carrie is being dragged towards is a pitch black hole in the screen, devoid of light. Later, however, inside the closet, sharp shadows surround Carrie, but her face stays sharp and fully lit. This switching between low-key lighting of the surrounding and high-key lighting of the main characters themselves communicates the terrifying place within which these characters are trapped, while also denying them any place to hide from that terror. Cinematographically, the use of high angle shots on both of the girls as they whimper (or scream, in Carrie’s case) and cower enforces this notion of powerlessness, of being trapped in the confining space. In addition, the lack of music in the scenes, or the almost inaudible volume of the music in the case of Halloween, leaves the audience with a feeling of abandonment; just like Laurie and Carrie, we have been cut off from outside influences; all we are left with is fear and the darkness of the closets. Moncur, Michael. “Marilyn Ferguson Quotations.” The Quotations Page. 2007. The Quotations Page. 10 Nov 2008 < http://www.quotationspage.com/quotes/Marilyn_Ferguson&gt;. This entry was posted in Academic and tagged Academic, Arts, Carrie, Essay, Fear, Film, Film Study, Halloween, Horror, Horror Films, Movie, Movies, Non-Fiction, Robin Jeffrey, Writing. Bookmark the permalink.